The Naval Wargames Page If I have a miniature gaming genre that I come back to repeatedly, it is naval war gaming. Currently, I have a lot of active projects in this niche of the hobby, but the ones that actually either have come to pass or will see fruition shortly are as follows. As I only have so much real estate on the top row of this blog, I will collect all Naval Themed game projects here. If it has a #naval tag on it, it’s probably one of these projects. The obvious candidate for many years was Games Workshop‘s MAN O’ WAR, which I own but haven’t played. Now I play in the 1:600(ish) scale. 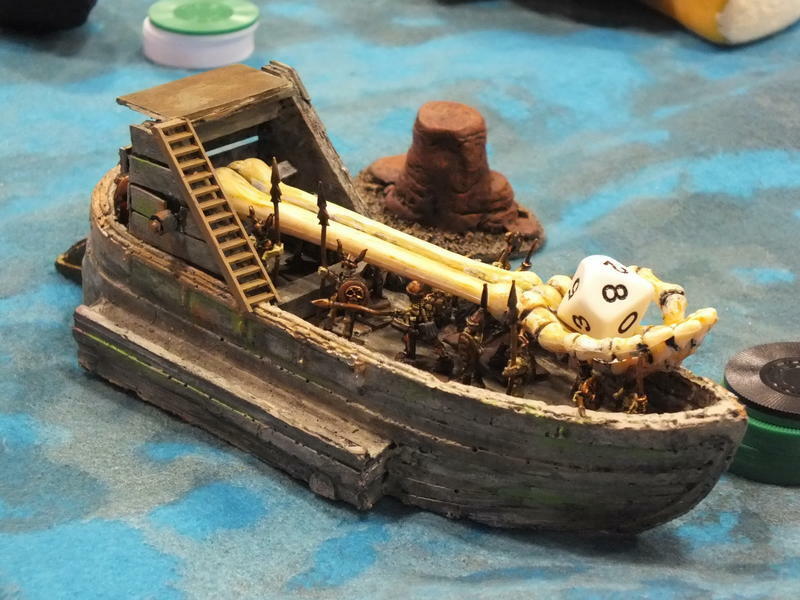 For this I use UNCHARTED SEAS models and rules from Spartan Games, as the ships are breathtaking and the rules a mixture of bloody, workmanlike and simple. They are a bit of alright, I think. Links: Uncharted Seas Gallery and Boneyard Sailing the Uncharted Seas (and other US posts on the same blog) Posts on UNCHARTED SEAS on this blog A whimsical account of a fantasy battle I posted to Calameo. 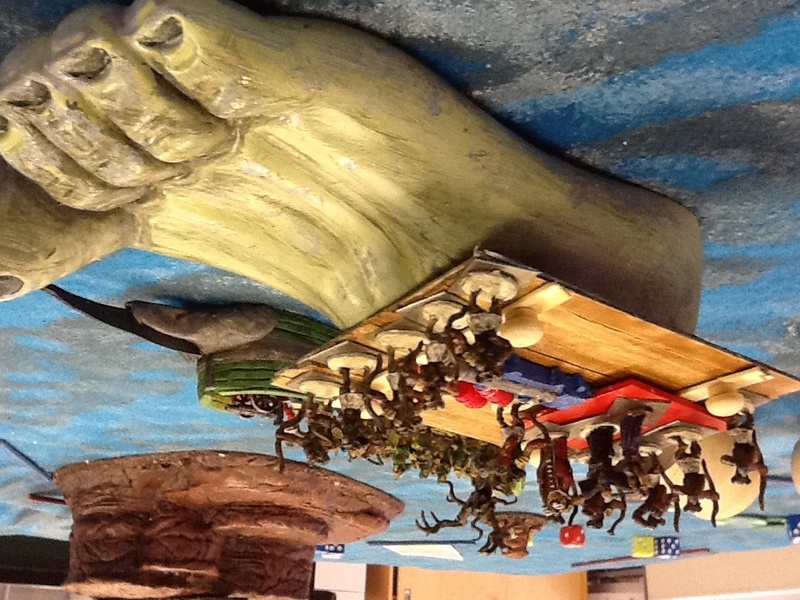 My latest nautical fixation is a 15mm scaled naval game for fantasy fleets called Big Danged Boats. There’s an old post on 50Megs.com (see below in links) which was a picture of the first ship in this series I attempted back in the early 2000s. This ship, a vile, wormy old resin cast galley I found in a flea market ages ago, became the Deadnought, the flagship of the Undead fleet, the Bone Brigade. In 2013, this game hit the table with a vengeance. Loosely put this is a game set in a vaguely defined fantasy setting of many races competing for land and resources on a planet that is mostly archipelago. The standard fantasy players are present and accounted for, of course. Early on, however, I decided that I wanted to be silly with this theme and really pushed the envelope with silly fleet concepts. So BDB (as I call it) might feature a ship made out of the foot of a dead God, or a steam powered, armored cheese, or gnomish dreadnought with a giant steam powered boxing glove as a primary weapon. When you throw rationality out the window; the results can be visually striking. As a rules set, I think it’s about 90 per cent there. I have refined the initial system in BDB 1.0 over the past year and may release BDB 1.5 to playtesters if they wish to give it a try. 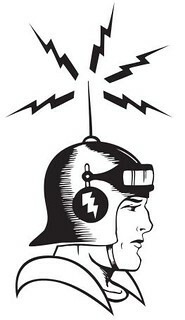 I’m working on the magic rules now as well as landing parties and marines.The future is fairly bright for BDB. I am in discussions with a resin caster to create ship hulls for BDB based on what I have designed so far and newer designs, as well as to carry the rules and cards for the game.You can learn more about BDB from the many posts I put up in 2013. BDB: Summon the Squid God? Now we have a squid god. 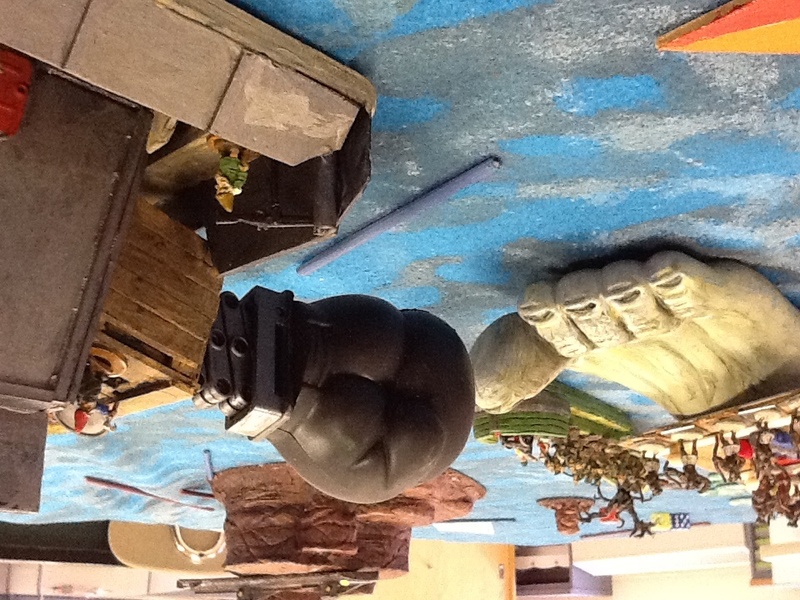 Game Camp 2014 Day Four: The End, CE, Room 25 and X-Wing! Game Camp 2016 Day 3: Shiverrrr me Timmmmbers! Gaming Camp Day 4: BDB and the Great Gnomish Civil War!! HI2 is reviewed on this blog, HERE, with follow up post. 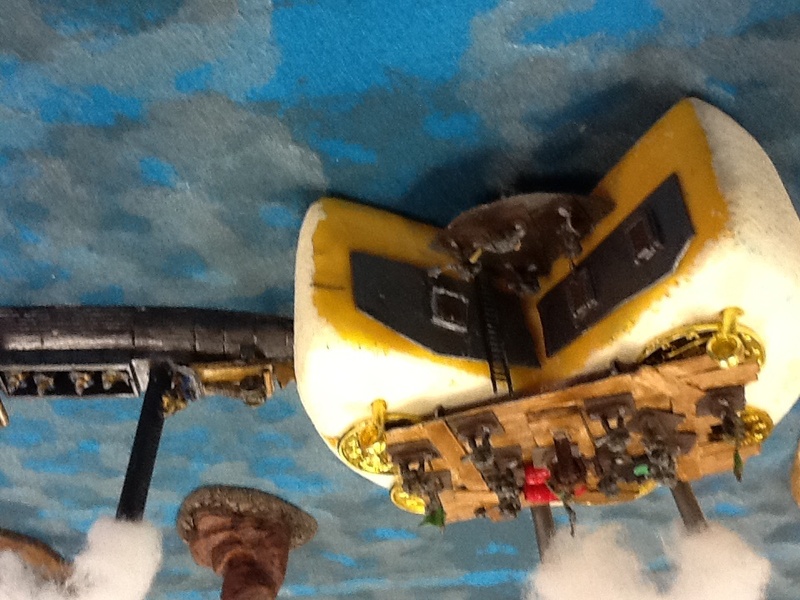 Ironclads by Yaquinto, ancient boardgame rules set often converted to miniatures. ALL AT SEA, 28mm “heroic” scale rules for fighting in a fantasy universe, specifically Games Workshops’ LORD OF THE RINGS system. Looks like it requires knowledge/ownership of the parent LOTR rules but that’s easy enough. Games Workshop’s Man O’ War may be a thing of the past but the Green Forest Trading Company is still out there cranking out tiny fantasy fleets that bear a striking similarity to the old MoW ships. Otherwise, I suggest scratch-building your own ships or visiting the Sea of Claws. I have many of the ships built but would like to get some crews painted and I need to get boarding combat done to the point where I’ll like them. Big Danged Boats page (very old) — many more ships have been built and painted since this was first posted, badly needs an update. I also have collected many of those AXIS AND ALLIES War at Sea miniatures in an attempt to run the SINK THE BISMARK campaign using the VICTORY AT SEA rules from Mongoose Publishing (I have no desire to play the purpose-built War at Sea rules from Wizards of the Coast/Hasbro… too simple). I have about 95% of the OOB to make that happen, just haven’t had the opportunity yet. I’ve been looking for reasonably small ships for a while and thank you for pointing me in the direction of Spartan Games. 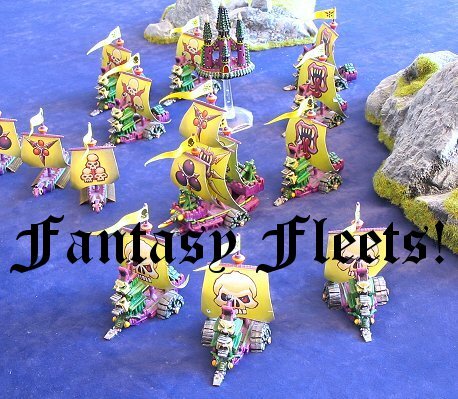 I would however like to know who produces the models for the fleet you have painted purple and green (with sculls) in your title picture, as these are exactly what I was after? They are pricey, but that’s the price you pay for a niche product. Hope that helps.